of tumors in bone and soft tissue like the palate or tongue. speech and play it back to the listeners for evaluation. ognition technique was previously developed [8,9]. 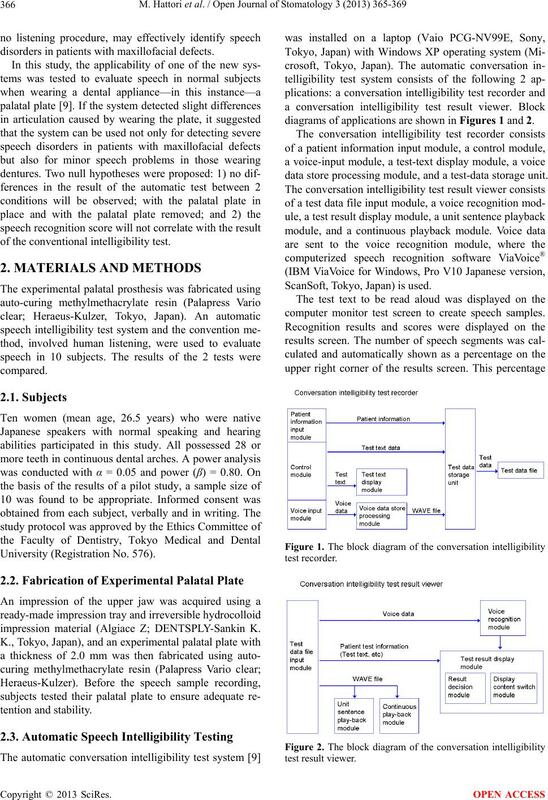 without requiring the inputs from human listeners. disorders in patients with maxillofacial defects. 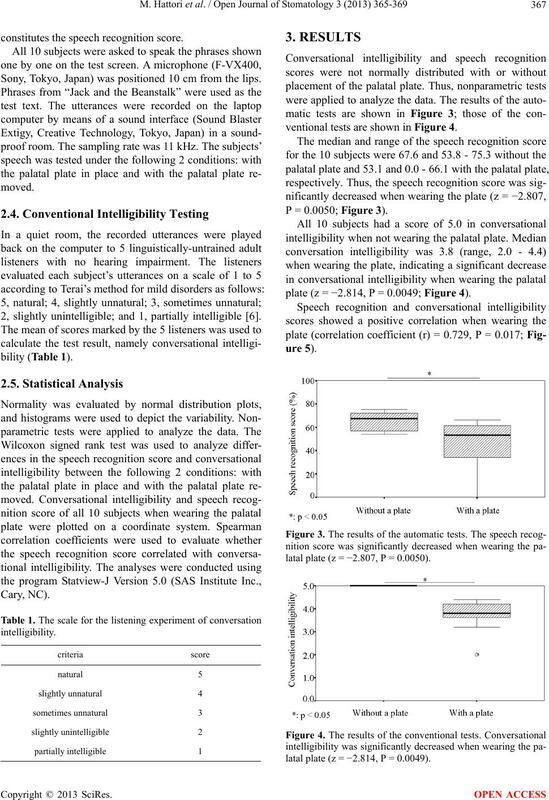 of the conventional intelligibility test. impression material (Algiace Z; DENTSPLY-Sankin K.
diagrams of applications are shown in Figures 1 and 2.
data store processing module, and a test-data storage unit. ScanSoft, Tokyo, Japan) is used. computer monitor test screen to create speech samples. 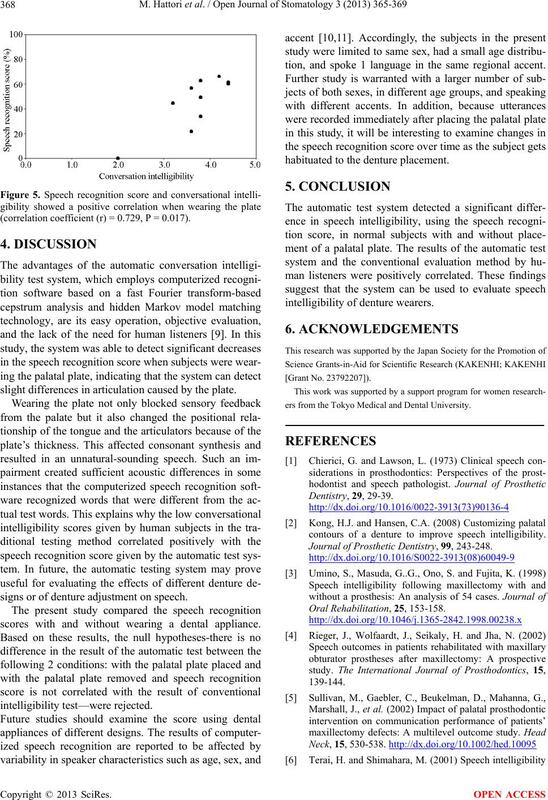 constitutes the speech recognition score. Sony, Tokyo, Japan) was positioned 10 cm from the lips. 2, slightly unintelligible; and 1, partially intelligible . ventional tests are shown in Figure 4. P = 0.0050; Figure 3). plate (z = −2.814, P = 0.0049; Figure 4). latal plate (z = −2.807, P = 0.0050). latal plate (z = −2.814, P = 0.0049). (correlation coefficient (r) = 0.729, P = 0.017). slight differences in articulation caused by the plate. signs or of denture adjustment on speech. scores with and without wearing a dental appliance. tion, and spoke 1 language in the same regional accent. habituated to the denture placement. ers from the Tokyo Medical and Dental University. 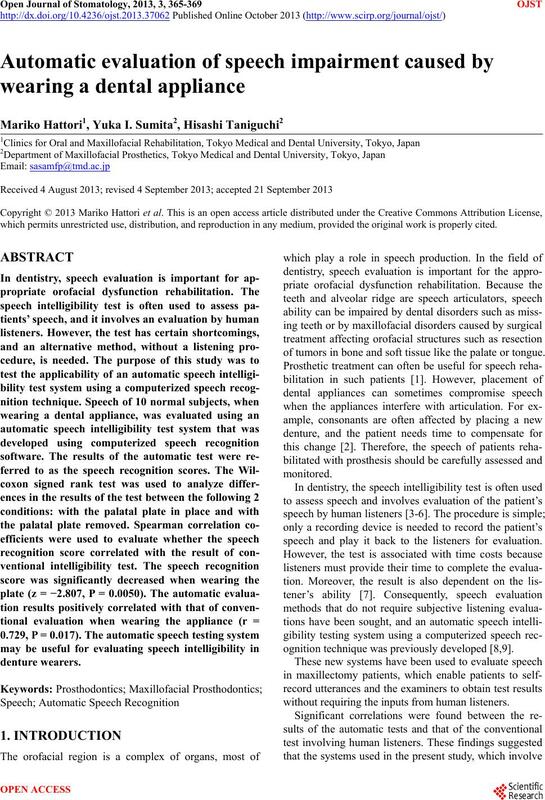 contours of a denture to improve speech intelligibility. Journal of Prosthetic Dentistry, 99, 243-248. 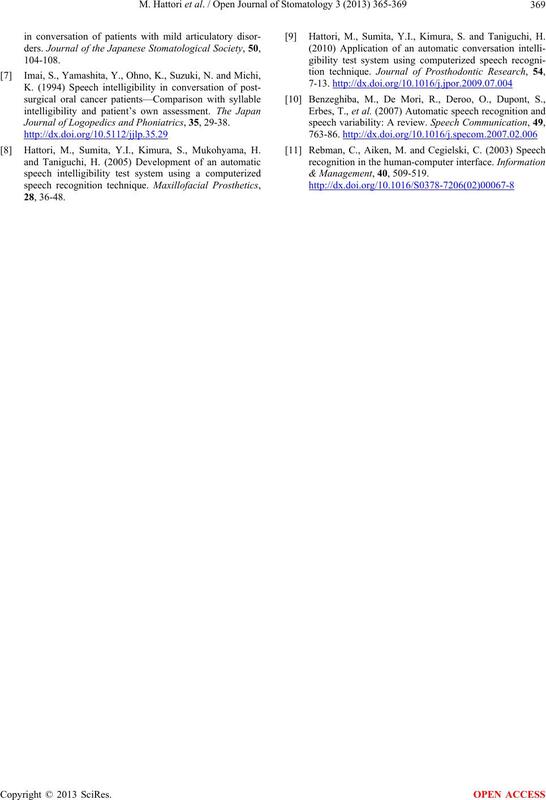 Journal of Logopedics and Phoniatrics, 35, 29-38. Hattori, M., Sumita, Y.I., Kimura, S., Mukohyama, H.
 Hattori, M., Sumita, Y.I., Kimura, S. and Taniguchi, H.